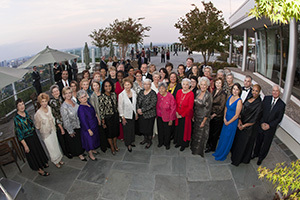 Samford University's Ida V. Moffett School of Nursing honored 50 alumni with Living Legacy Awards during its 90th Anniversary gala Oct. 13. The honorees "were selected for the impact they have had on the mental, physical and spiritual well-being of others," said nursing Dean Nena F. Sanders. "These individuals have perpetuated Mrs. Moffett's legacy of academic excellence, caring, compassion and service around the world in order to make a significant impact on humanity." The award recipients all hold degrees from the School of Nursing or its forerunner, Birmingham Baptist Hospital. They represent a variety of specialties within the nursing profession, entrepreneurship and missions. More than 425 attended the program at The Club in Homewood, Ala. Samford president Andrew Westmoreland said he was moved by the stories of the honorees and noted that the night was also about numbers-the School's 90 year history and the 50 outstanding alumni who represent the more than 6,000 Moffett Nurses around the world. Teresa Stanford, a 2010 graduate of the Doctor of Nursing Practice program, was typical of the award recipients, saying, "I am deeply honored to have received such a prestigious honor and gratified to have been able to enjoy the event with family and friends. I am so proud to be able to identify myself as a part of the Samford family." In addition to recognizing alumni, the Living Legacy Gala raised essential funds for student scholarships. Presenting sponsor was Princeton Baptist Medical Center; gold sponsors included Pete Hanna Charitable Foundation and Money Family Trust. Jo and Robert Kicker were benefactor sponsors. Patrons included the Alexander, Sheffield and Warr families, Birmingham Baptist Hospital Class of 1959, Birmingham Baptist Hospital Class of 1967, Friends of LeeAnna Cunningham, Sallie and Greg Eagerton, Paula and Kerry Gossett, Frances Watts Johnston, Gretchen and Randall McDaniel, Nurse Anesthesia Class of 2005, Dr. and Mrs. Stuart Pope, Dean Nena F. and Dr. Tommy J. Sanders, Gloria and Carl Schaefer, Samford CRNAs 4 Kids, Sherlock, Smith and Adams, St. Vincent's East, Trinity Medical Center and UAB Hospital. Each Living Legacy honoree received an inscribed globe signifying the worldwide impact of Moffett Nurses.